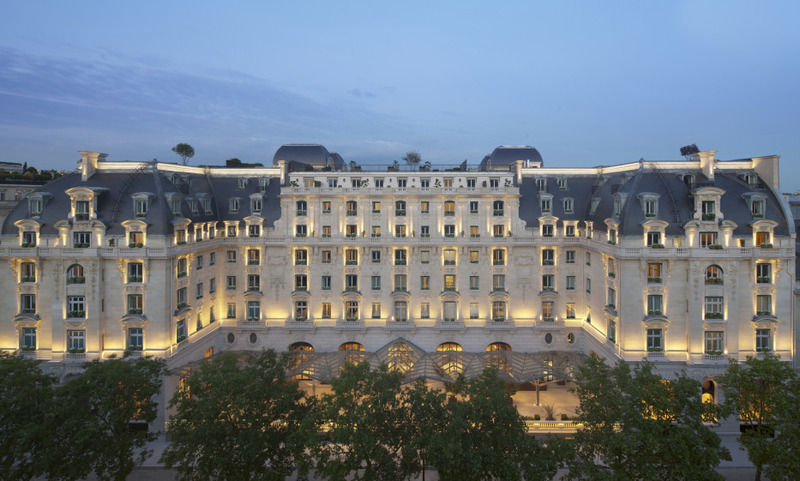 The Peninsula’s vision of a Parisian Grande Dame is a beautiful one. One can never have too much luxury. With a location that’s only minutes away from l’Arc de Triomphe, the Champs-Elysées and the Place de la Concorde, the Peninsula Paris’ gorgeous Haussmannian interiors and palace standards make it almost too good to be true. To the modest and proponents of the austere…stay away. In a hotel where Rolls-Royce Phantoms run airport errands and where the lobby is graced by a Lasvit sculpture made from 40,000 pieces of gold leaf, one must embrace excess. Up and up, in the L'Oiseau Blanc restaurant, is where the city’s power players lunch, picking from a finely selected wine list by Sommelier David Thuizat and feasting on dishes which sing with Michelin potential. Five of the hotel’s suites come with private rooftop gardens and breathtaking views of the city, and the spa is a subterranean oasis with one of the longest hotel pools in Paris. For a stay where indulgence, opulence and panache are spelled with capital letters, this hotel on Avenue Kléber is it. Best hotel in Paris we have stayed. Very professional staff and opulent property with architectural motifs from the grand past. Lots of technology in the room, a trademark of all Peninsula hotels, together with a separate dressing room and huge bathroom. SERVICE WITH LOTS OF GRACE. After staying in several Parisian palaces, this was our first experience at the Peninsula. It’s a superb discovery…. without a doubt we are going back! a beautiful, well managed hotel with friendly, efficient, professional staff. your stay is prepared with care and attention to every detail. we enjoyed a beautiful room and attentive service. when we were leaving the concierge staff arranged for a box to be sent to our home. concierge staff is extremely well informed, courteous, and friendly. the hotel is beautiful--and the staff is outstanding. Perfect Location, perfect room and the quality of the breakfast was excellent. We are looking forward to come back. A perfect stay. The staff were divine and I would like to thank Rodrigue in particular for his spectacular service. We were pleasantly surprised by the welcome and friendliness and the personal touches that this hotel brings. Everything was perfect, once again, thank you for this stay. Great hotel that delivers old world charm with great modern technology. Every member of staff we dealt with was fantastic getting the mix of professionalism and friendliness just right. Overall it is very hard to find areas for improvement. An unforgettable experience. I never thought that such quality service could exist, but at the Peninsula, it does. The staff is charming, discreet, attentive and efficient. Everything was perfect. I can only congratulate the whole team and Grand Luxury Hotels for choosing this wonderful address in which I will surely return. It is of no equal. THE best hotel in the world. The Peninsula Paris is a magnificent hotel with a very good level of service. The staff here are courteous,friendly and efficient. We loved the rooms as well. The hotel is a brand new hotel and the level is very high. It is one of the best hotels in Paris. We enjoyed our stay at the penninsula very much. The ride with the electric bisycles from the hotel, was fantastic, we did a nice tour in Paris. Top Hotel !!!! This is a marvelous place and a great addition to the top hotels in Paris. Staff is super friendly and excellent. Rooms are very well fitted and configurated. Food and drinks very good and the l'oiseau blanc is spectacular, especially for its ambiance. Sumptuous hotel and impeccable service. Clarification regarding the breakfast: it was an A la carte breakfast (no buffet), but the service was not good. Very good hotel. A few minor drawbacks. Breakfast very banal, very slow service. I am still waiting for my toast. One last note: towels in the rooms were full of dust ... very unpleasant. The concierge staff was extremely friendly. The Spa is extra with the facilities and staff at the top. Perfect hotel, once some little things will be resolved. Very nice hotel and a nice SPA. Friendly and helpful staff. There are still some improvements needed in some processes.